Or, more accurately, the Skrulls are already here. Captain Marvel will introduce the shape-shifting aliens to the MCU in 2019, and the film will be set in the '90s. Nick Fury (Samuel L. Jackson) will still have both eyes, Phil Coulson (Clark Gregg) won't be wincing every time he hears the word "skewer," and Steve Rogers (Chris Evans) will still be in deep freeze. More importantly, a race of aliens who make a habit of hiding in plain sight will be infiltrating our world. 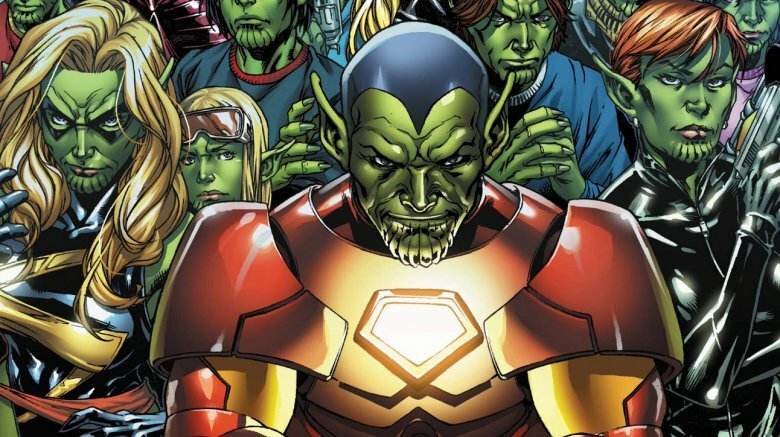 Because of the 2008 Marvel Comics event Secret Invasion — which revealed that some Marvel heroes had actually been Skrulls in disguise for years — there's a lot of speculation about how their introduction will change what we all think we know about the MCU. Most of the movies' heroes have high-profile connections. Spymasters, scientific geniuses, government leaders, and bona fide gods are regulars. If you were an alien spy meant to disrupt the Earth's infrastructure, the characters of the MCU would be valuable targets for you to replace. A Skrull disguised as someone in Black Panther or Thor could be whispering venom into the ear of a king. A Skrull infiltrating S.H.I.E.L.D. would have nearly limitless access to Earth's military and intelligence. A Skrull infiltrating something comparatively mundane — like, say, a trio of goofy thieves — could find himself gaining access to some of the Earth's greatest minds. Considering all of that, here's who we think might be a Skrull in the MCU. 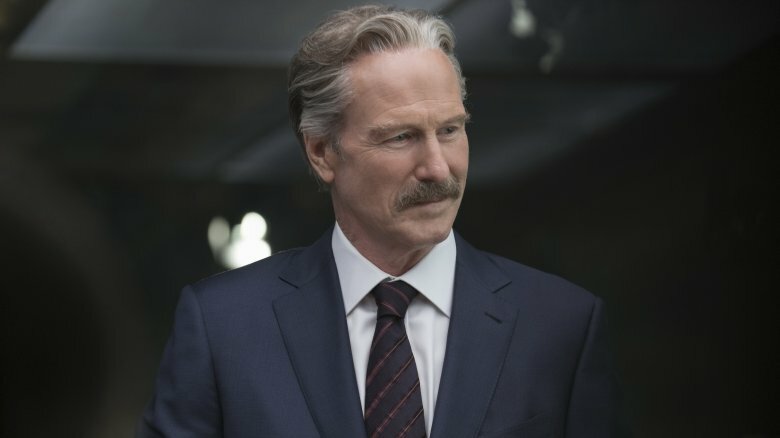 Secretary Ross (William Hurt) would have been a prime target for Skrull infiltration even before his cabinet appointment. Initially an influential army general in 2008's Incredible Hulk, by 2016's Captain America: Civil War, Ross had been appointed United States Secretary of State and put in charge of the effort to rein in the Avengers. As a general, he was a powerful man with access not only to a vast military arsenal, but to all of the military's dirtiest secrets, including its earliest attempts to make its own superheroes. As Secretary of State, he'd be even more enticing to the Skrulls. It would give them a man in the White House, a man with deep connections in the military and the United Nations, and one who could give orders to the world's superheroes. Despite of being a U.S. cabinet member and a former army general, Ross' actions certainly haven't helped with the defense of Earth, have they? Ross was the one who dropped the Sokovia Accords on the Avengers' conference table and split the team in two. Once the Accords were signed, Ross was the one who showed no mercy toward the heroes who went renegade, even when the Earth was facing another alien invasion in Infinity War. In Civil War, Ross claimed it was a heart attack that turned his life around. Maybe there was no heart attack. Or maybe there was, and the real Ross didn't survive. 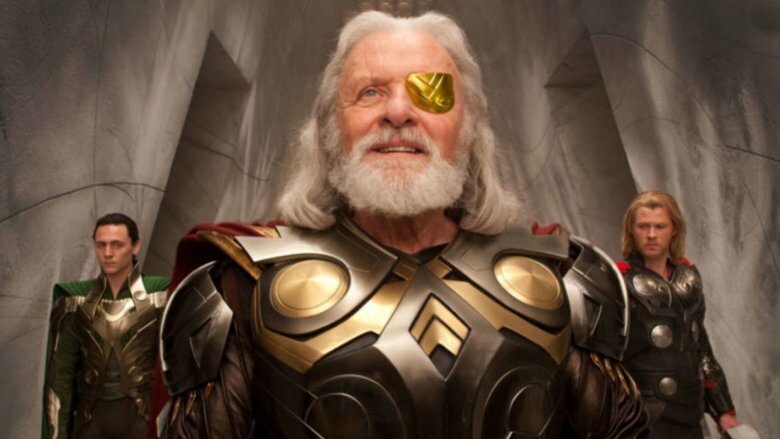 It's tempting to consider Odin (Anthony Hopkins) a prime suspect for Skrull infiltration. First, there's the opportunity. It could have been the Skrulls who released Odin from the mystic prison Loki (Tom Hiddelston) placed him in, giving them time to replace him with a double. Second, there's Odin's behavior in Ragnarok. Odin speaks of Norway with great reverence and love. He refers to Norway as "home" and later suggests the Asgardians could move there. Yet in Thor: The Dark World he talked about Earth and its people like something he wanted to scrape off his boot. He said Jane Foster (Natalie Portman) being in Asgard was like bringing "a goat to a banquet table." Third, there's the unexplained nature of his death. We're told his passing releases Hela (Cate Blanchett), but not what is killing him. He's just chillin' with the Odinson bros and then he's glitter. Fourth and finally, there's what happens as a result: Asgard is utterly destroyed. Its people are refugees, and even the survivors of Hela are thinned out by Thanos (Josh Brolin) and his Black Order at the start of Infinity War. We're not saying Odin was definitely a Skrull. If he was, though, helping to bring about the almost complete annihilation of a people known for helping defenseless planets probably got him a pay raise. Just sayin'. 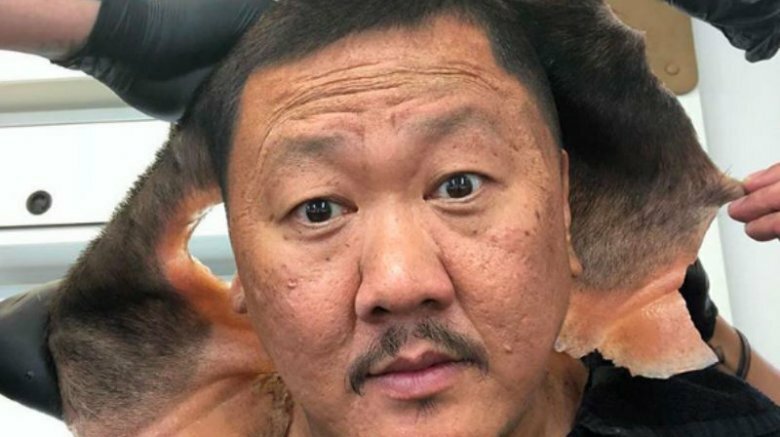 In September 2018, Benedict Wong (who plays the character Wong) posted a photo from the make-up chair at the Avengers 4 set that sparked speculation. The pic showed the hands of (presumably) make-up artists removing some kind of prosthetic pieces from Wong's head. A caption accompanied the shot: "Happy to be filming… but the cleaning of spoilers is a bit much!" There's no way to know exactly why Wong was wearing the prosthetics until we see Avengers 4 , but a number of his followers speculated that it could have something to do with his character being replaced by a Skrull. It's not a bad guess. The mystic forces of Kamar-taj, where Stephen Strange (Benedict Cumberbatch) learns to wield magic in 2016's Doctor Strange, would be a potential threat to any invading alien force. Strange and Wong's concerns may be more mystical, but if the Skrulls came to town, they wouldn't leave the Sanctums untouched. The shape-shifters would want someone to infiltrate the group, and Wong is a perfect candidate. He isn't, as far as we know, in charge — we don't actually know if anyone has taken the mantle of leadership since the Ancient One's (Tilda Swinton) death. But as the librarian, he has an intimate familiarity with Kamar-taj's warehouse of arcane knowledge. In Infinity War, Wong left the other heroes shortly after the New York battle with the Black Order so he could fortify the Sanctums. That may have given the Skrulls an opportunity to nab and replace him while we weren't looking. Does Bucky even know who he is? You might argue that Bucky (Sebastian Stan) would be the absolute worst choice for Skrull infiltration. Bucky is damaged goods. His brainwashing at the hands of Hydra not only forced him to commit atrocities, it made him vulnerable to the machinations of Helmut Zemo (Daniel Brühl) in Captain America: Civil War. He's so much of a threat he asked to be put back in cold storage so no one could use him to kill anyone again. Why would a Skrull want Bucky as a disguise when no one trusts him? Despite all that, look where Bucky finds himself. In two major conflicts, he's fighting alongside (and against, in the case of Civil War) Earth's Mightiest Heroes. In Infinity War, he has the monarch of the most technologically-advanced nation on Earth personally delivering him a new arm. Bucky has access to powerful people, and before being freed from Hydra, he committed acts that served to destabilize the world's governments. It's possible that if Bucky is a Skrull, he isn't aware of it. If earthbound agencies like Hydra have mind-wiping technology, it's a fair bet more advanced interstellar races could have the technology to make their own agents forget who they are. 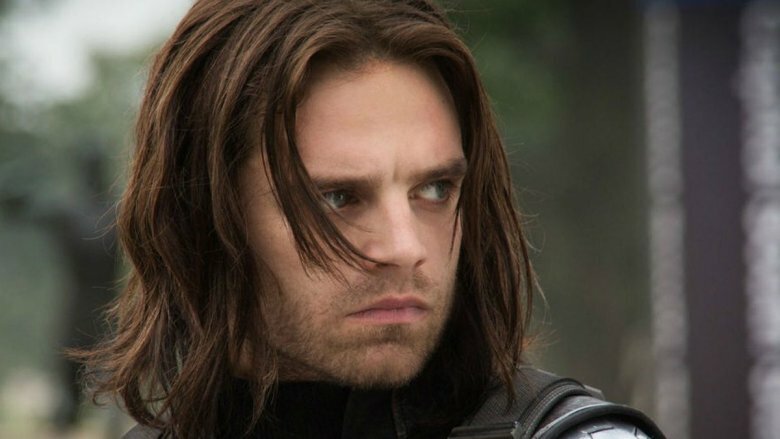 It's even possible — maybe reaching, but possible — that in the MCU, the real Bucky Barnes died from his fall in World War II and that all we've seen since then is his Skrull replacement. If the Skrulls can get someone into the Wakandan leadership, they will. With technological might decades or perhaps even centuries beyond the rest of the world, Wakanda represents the biggest threat to any alien invasion. 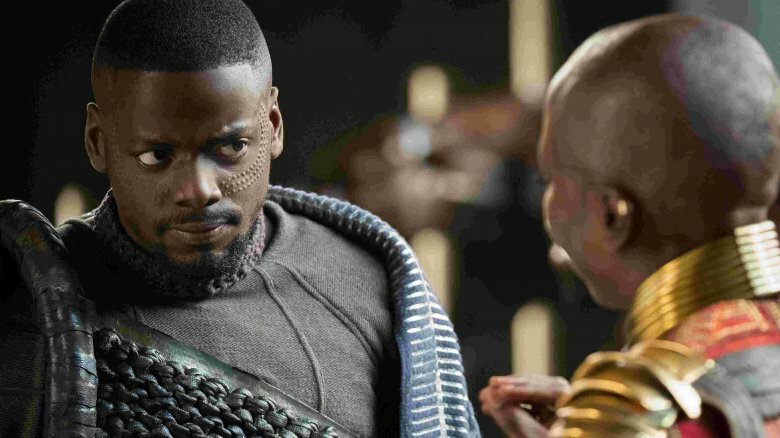 Of all the Wakandans we met in Black Panther, the most likely candidate is W'Kabi (Daniel Kaluuya). W'Kabi is a prime target for Skrull replacement. Before making the mistake of supporting Killmonger's (Michael B. Jordan) regime, W'Kabi was good friends with T'Challa (Chadwick Boseman) and was present at all council meetings. His romance with Okoye (Danai Gurira) gives him access to the woman in charge of T'Challa's personal security. A Skrull masked as W'Kabi would be perfectly placed to cause havoc in Wakanda. And that's exactly what W'Kabi did. Killmonger may be the villain of Black Panther, but arguably no character in the film is more two-faced than W'Kabi. Almost as soon as we meet W'Kabi, he's turned his back on T'Challa. He fully supports the plan to send high-tech weaponry to other parts of the world, hoping to destabilize governments. Even after it's revealed that T'Challa survived his duel with Killmonger — making Killmonger's claim to the throne forfeit — W'Kabi continues to support his friend's would-be killer. Killmonger, at least, was honest about his intentions as soon as he came to Wakanda. W'Kabi cannot be trusted, and if there's a Skrull in the Wakandan throne room, it's him. Have we ever met Black Widow? If Black Widow (Scarlett Johansson) is a Skrull, it would make some of the MCU's most powerful entities uncomfortable. The Avengers, Stark Industries, S.H.I.E.L.D., the Russians, and even the Wakandans would have reason to worry about their secrets being compromised. Such a revelation could also explain some of her behavior, her relationship with Bruce Banner (Mark Ruffalo) being a prime example. When Banner frees her from Ultron's (James Spader) prison at the end of Avengers: Age of Ultron, Banner offers her the opportunity to run away with him as Widow had suggested earlier in the film. Instead, she shoves Bruce off a precipice in order to turn him into the Hulk. Sure, maybe it was because she wanted to help fight the good fight, but maybe she was more interested in making sure an unstable element was present in the fight against Ultron. She's also the only hero in Captain America: Civil War to switch sides, and she did it at a pivotal moment. When she caught up to Cap (Chris Evans) and Bucky in the hangar, she could've ended the conflict. Instead, by turning on Black Panther, she prolonged the fight and the split between Cap and Iron Man (Robert Downey Jr.) was that much more complete. 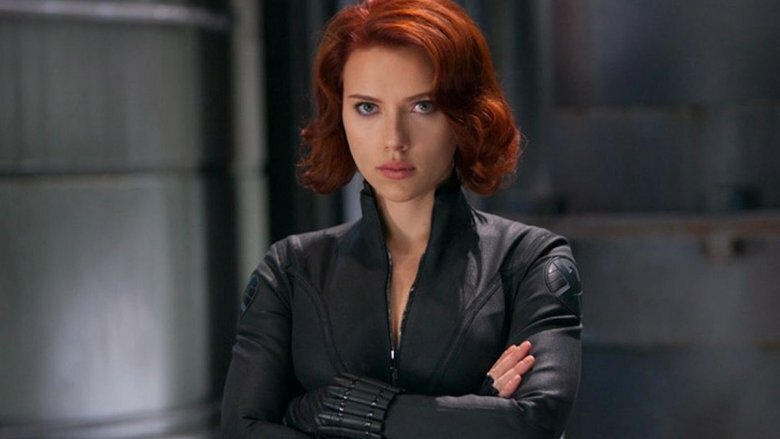 Considering her experience with esponiage, it's tempting to wonder if we've ever met the real Black Widow, even moreso when you consider the rumor that Widow's solo film is going to be set in the past. 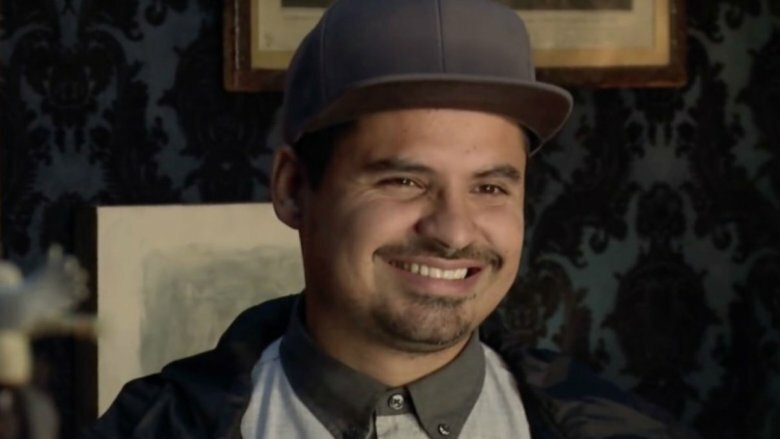 Vetting Luis (Michael Peña) for Skrullhood may seem like a leap, but try to put think about the benefits. Hank Pym (Michael Douglas) is one of Earth's foremost scientific geniuses. He represents a threat to, and an opportunity for, the Skrulls. But unlike other MCU geniuses like Tony Stark, Bruce Banner, and Shuri, he's almost completely off the grid. He's not connected to a corporation, super-team or government the Skrulls can infiltrate, so they would need to think outside the box. Luis is an easy target. In the beginning of Ant-Man, when Luis drives Scott Lang (Paul Rudd) home from prison, we learn that Luis' girlfriend just left him, his dad died, and his cousin got deported (but hey, he got the van). In short, he probably doesn't have a lot of family connections left for a spy to contend with. And Skrull infiltration could explain some of Luis' particular quirks, like the way he tells stories. Maybe he's giving too many details to sell the truth of his stories because he's really a spy. It could also explain his extraordinary strength. Let's not forget the consequences of Luis' actions. It was Luis who proposed the robbery that got Lang connected to Pym. It was also Luis who told Lang that Sam Wilson (Anthony Mackie) was looking to recruit him, which not only helped fuel the conflict of Civil War, but also landed Ant-Man under house arrest and left Pym on the run. In 2012's Avengers, Stark tells Rogers that Nick Fury is "the spy. His secrets have secrets." And no matter whose side you fall on in any Cap vs. Iron Man conflict, you have to admit that Stark is right. 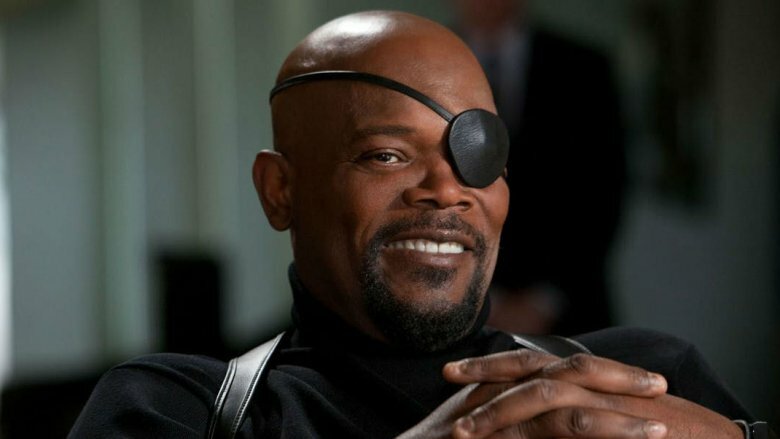 Nick Fury is, when it comes the MCU, the ultimate spy. So, how exactly did the ultimate spy not notice a completely different organization taking over S.H.I.E.L.D.? There are reasonable answers to that, and one of them is… maybe he's not Nick Fury. The advantages the Skrulls would gain with one of their own replacing Fury are obvious. They've had plenty of opportunities. He's died, disappeared, and reappeared enough times. He could've been replaced in the middle of Winter Soldier, before Age of Ultron, or any time before his appearance in the post-credits scene in Infinity War. Another tempting possibility to contemplate is that Fury could be the J'on J'onzz of the MCU. In CW's Supergirl, it was revealed that the head of the Department of Extranormal Operations, Hank Henshaw (David Harewood), was actually the Martian hero J'onn J'onzz in disguise. The real Henshaw was a violent xenophobe J'onzz was forced to kill. He replaced Henshaw with the goals of redeeming the man's name while steering the D.E.O. toward tolerance. It's possible we've yet to meet the real Nick Fury. Maybe Fury died years ago. Maybe a Skrull replaced him, but maybe that Skrull has been trying to prepare Earth for the invasion he knows is coming. War Machine may not be an A-list superhero in either the comics or the movies, but as far as Skrull targets go, he'd be one of the most mouth-watering candidates in the MCU. Think about it. Kidnapping or killing, and subsequently replacing, James Rhodes would give the Skrulls more than they could get with just about any other single infiltration target. They would have a Skrull who was not only an Avenger, but one of the few remaining Avengers to not be a fugitive from the law (at least not until Infinity War). They'd have someone with a close relationship to Tony Stark, a man so important to the human race's well-being that even Thanos knew who he was. Before Rhodes was acting as War Machine full-time (and, briefly, as Iron Patriot), he was a U.S. Air Force consultant to Stark Industries, giving him high ranking access to the military and Earth's most important technologically-minded corporation. How the Skrulls replaced Rhodey would be up to speculation and debate. But as for the when? Well, that's the best part. 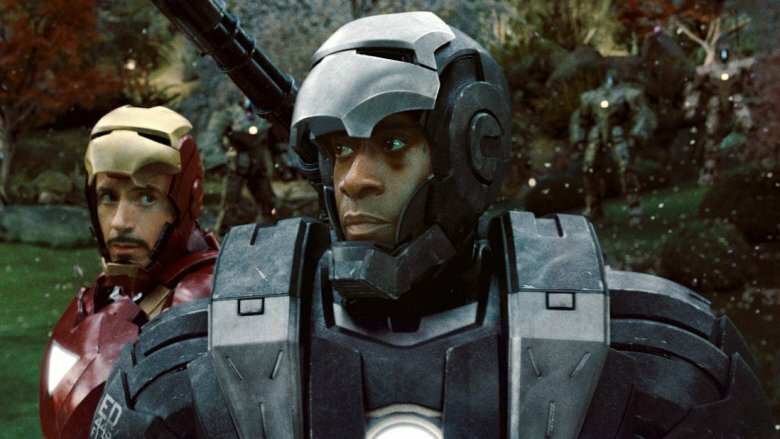 If it were revealed Rhodey was a Skrull, can you imagine how many jokes could be mined from how different Rhodey looks between Iron Man and Iron Man 2? Terrence Howard probably wouldn't laugh. The rest of us would, though. 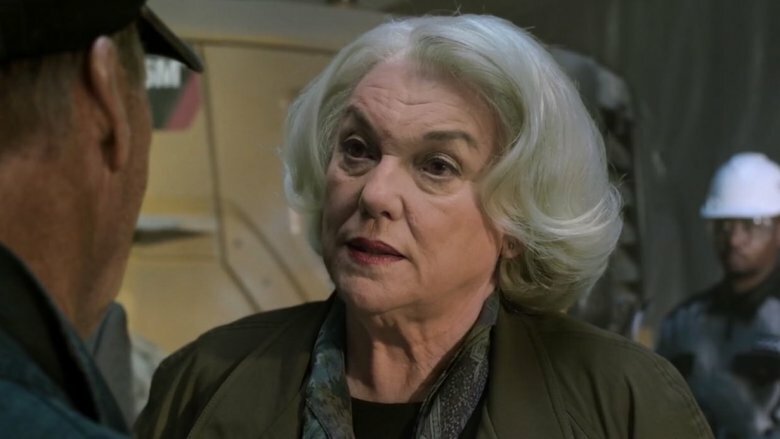 Older audience members were likely pleasantly surprised to see Tyne Daly show up as Anne Marie Hoag in the first few minutes of 2017's Spider-Man: Homecoming. Daly's been in the business a long time, but she's best known as the Lacey half of the critically acclaimed '80s cop drama Cagney & Lacey. That's one of the reasons we think Hoag might be a Skrull — the casting of Daly seems too high-profile for a character who would just show up for thirty seconds to figuratively put her foot on Adrian Toomes' (Michael Keaton) neck and then disappear. Besides the casting, let's look at what Hoag is doing. Hoag is there as the head of Damage Control to recover the Chitauri technology left in the streets after the Battle of New York. Considering what such a task could mean in terms of advancing Earth's warfare capabilities, a Skrull would want to be the one overseeing it, wouldn't they? Not to mention that when Hoag told Toomes to pack it up and leave, it helped transform Toomes into the Vulture. Skrull or no, that probably wouldn't be her intent, but she likely wouldn't shed any tears over it, either. That may even be why, though neither Toomes nor his cohorts seemed like the sharpest tools in the shed, no one seemed to notice that they'd kept a hefty chunk of the Chitauri tech for themselves. Maybe a Skrull-replaced-Hoag liked the idea of morons running around with Chitauri tech and making trouble for Earth's defenders.